I never read any YA fiction that had faeries in it because I never found them interesting. Just like my avoidance for paranormal romance in YA, I felt like faery fiction was just the same as the others. No offense to any Twilight fans, but I don’t really want to read another variation of a Bella Swan head over heels on a variation of an Edward Cullen who isn’t a vampire. I thought: vampires = angels = fairies = meh. So I avoided them. Truth be told, I was wary at first. I don’t really give up on the books I read, and I try as much as I can to finish them out of respect. I was more than ready to just finish this book and not pick up the next books in the series, if only to satiate my curiosity for faeries. Fortunately, The Iron King proved me wrong. :) The Iron King is the first book in the Iron Fey series, and it tells the story of Meghan Chase, who never quite fit in at school or at home, but it could be any kind of teenage thing. But on her sixteenth birthday, things get stranger: her best friend is extra protective, some weird things happen at school, and her brother gets kidnapped by a mysterious creatures and replaced by a changeling. As her eyes are opened to the other world that exists with hers and the true personality of her best friend, she enters the faery world to rescue her brother only to find out that she’s actually the daughter of a faery king, and that she is wanted by different faery courts for reasons yet to be revealed to her. I was pleasantly surprised at how much I enjoyed The Iron King. I’m not knowledgeable with faery stories (I have never read Midsummer Night’s Dream) so I was impressed with the world building that the author put in the story. I liked how the faery world had an ethereal and magical feel to it but without losing the dangerous edge that reminds not only Meghan but the readers that faeries are not just pretty creatures but wily, cunning ones too. It was like imagination overdrive as I was introduced to the Summer Court — I can imagine all the bright colors and different creatures and personalities introduced but it wasn’t very overwhelming that I miss the story altogether. There was little about the Winter Court here (but I think that’s the focus of The Iron Daughter), but I really liked the concept of the Iron Court. The romance in the story is already given in the blurb, so it wasn’t really a surprise for me. I wasn’t floored by it either, but maybe it’s because I have insanely high standards for romance in a book. While I saw the development between Meghan and Ash from a mile away, I kind of felt that their first romantic encounter was too abrupt. But then again, that may be my insanely high romantic standards speaking. I liked the Ash and Meghan love team…but I can’t help but feel sorry for Puck, too (enter Best Friend vs. Other Guy theory). I hope there would be more Puck in the next book? The overall message of the book is a bit off-putting, though, much thanks to The Book Smugglers for pointing it out. It seems like the real enemy that everyone seems to be pointing to in the book is technology, but I’m sure we all agree that not all technology (computers, system memory, etc) is bad. Perhaps the need for more is, but not just technology. I sure hope this would be tackled further in the next books because I’m curious to how this will be addressed. 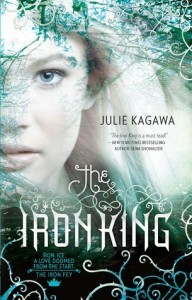 Regardless, though, I really enjoyed The Iron King, and I think it is a good start to a series. I look forward to reading The Iron Daughter and The Iron Queen.